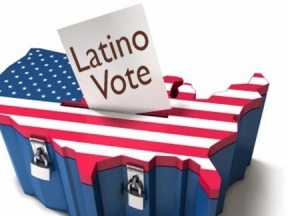 Targeting more than 350,000 unregistered, eligible Latino voters in Illinois, the Latino Policy Forum is proud to announce the launch of the Voto X Voto campaign—a collaborative effort including members of the Illinois Latino Agenda and other civic organizations to register 5,000 voters by October 7 and reach one million Latinos through coordinated public outreach. Voto X Voto—or Vote by Vote—focuses on the exponential power an individual vote can have on communities and the potential influence thousands of new Latino voters could have on elections. Just 19,000 votes determined the 2010 Illinois gubernatorial race. On Election Day, the Forum expects thousands of new voters to go to the polls and cast an educated ballot. This campaign will work to remove barriers that exist for eligible voters and will contribute to building a voting culture among Latinos in Illinois. “Latinos have a lot at stake in the next election. With greater turnout during Early Voting and Election Day, they have potential to determine the outcome of major statewide offices,” said Sol Flores, executive director of La Casa Norte. La Casa Norte, a member of the Illinois Latino Agenda, is one of 11 organizations that have signed on to this effort.